Mini Pan & Tilt Camera - Image Inspection Services Ltd. The Mini Pan and Tilt camera is the smallest pan-and-tilt camera head available from Image Inspection Services. The head can be pushrod- or crawler-mounted and can be used for 4-inch pipe inspections where straight-viewing heads cannot adequately view defects. It negotiates 90-degree bends in 4-inch pipe. 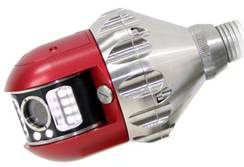 The low-light-sensitive movable color camera head has dual directional lighting. It operatesx through up to 2,000 feet of multi-conductor cable. All-solid-state circuitry withstand shocks and vibration. Remote focus, 90-degree turn, 360-degree rotate, adjustable close-up lighting intensity, and return-to-center controls are on the system joystick. The camera provides digital signal transmission with auto self-levelling, tilt and rotation, automatic system diagnostics, and 360 degrees of endless radial rotation viewing. The rotating camera and lighthead configuration provides 270 degrees of pan and tilt angle. The 70-degree lens viewing angle yields a total pan-and-tilt viewing of more than 300 degrees, providing 70-degree rear viewing capability for incoming lateral inspection when camera is moving away from connections. Combined with the company’s Gopher crawler, the unit can inspect 6- to 24-inch lines.